We arrived to Prague safe and sound! Even though we didn’t get much sleep at night as the flight left Ben Gurion Airport at 5:20 in the morning, we dropped our bags in our great new rooms and quickly left to explore the city. 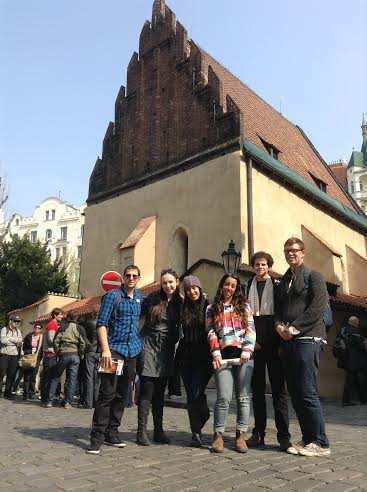 We started our day with a trip to Josefov, the Jewish quarter. 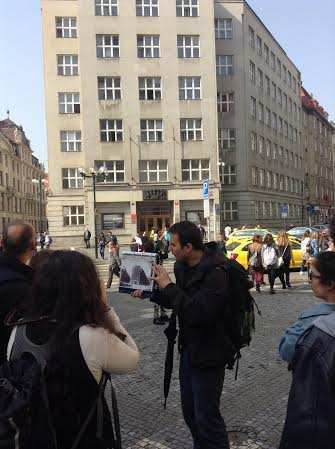 During WW2 most of the Jews that used to live in this neighborhood were sent to Teresinshtadt and later to Auschwitz. The only reason this neighborhood was left so preserved under Nazi occupation is that Hitler wanted to put together a museum there. this museum was meant to allow people to learn about the Jewish people, after they will be completely annihilated. 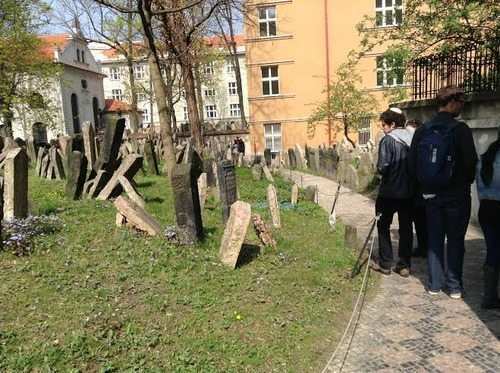 In the middle of Josefov lies a very ancient grave yard in where Franz Kafka and Rabbi Law are buried amongst many other historic figures. When we walked between the stones Karin held a list with the different meanings of Jewish symbols that tend to appear on Jewish graves. every time we noticed a symbol on one of the stones, Karin interpreted it for us, for example, a drawing of a bird is usually a symbol for a female .. One of the Synagogues we had been to has more than 77,000 family names written on its walls, the names are of Czech families that were murdered in the Holocaust. My grandfather was born in a small Czech village and most of his family died in the holocaust but unfortunately, I couldn’t find his last name on the walls as there are simply too many… it would have taken me the whole day. The quantity of names is unimaginable. After a nice lunch in a delicious pizza place we headed to the Old square right on time to see the famous astronomical clock go off (it goes off every hour). We headed on to Charles Bridge and crossed to the other side of the river, not before we admired the great view of the Valtava River. 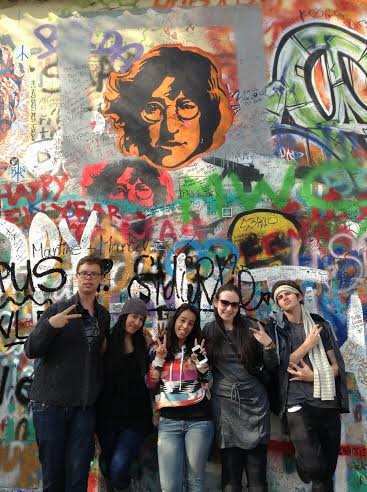 We reached to the John Lennon wall that was covered with graffiti art. In 1980, after Lennon’s death. 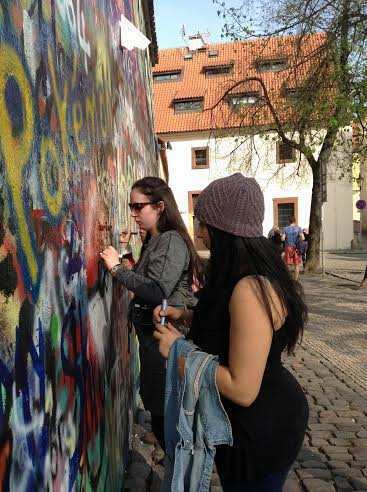 Czech citizens began painting graffiti slogans on the wall against the government and the Communist regime. No matter how many times the government re painted this wall white, the protestors kept on reviving it. Today the wall mainly represents John Lennon’s aspiration for peace. We contributed our share to maintaining the wall’s unique existence with our own slogans. 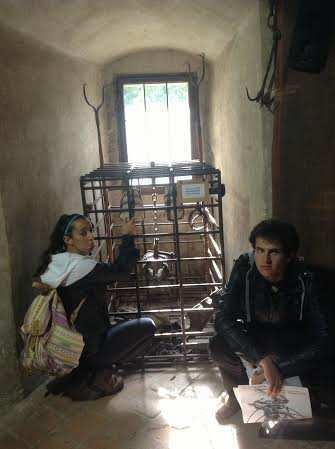 Later that day we headed out to the Medieval Tavern. 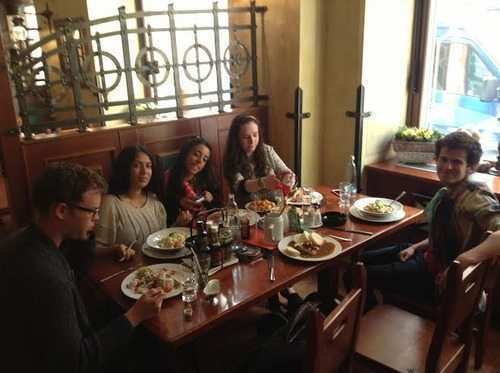 It is a restaurant that is located right at the footsteps of Prague’s Castle. Aside from the great food and homemade Czech beer- dancers, and performers fight, dance and perform fire tricks around the tables as if this place exists in the fifteen hundreds. My highlight of this evening was when two priests decided that Rachel is a witch and sprayed holly water on her! After 5 minutes of a very intense ceremony she was declared purified..
I’ll write you again tomorrow to let you know how our day went, so far it seems the group is having a lot of fun! they are very energetic and positive and simply a pleasure to spend time with! We were worried that due to the foreign ministry strike, we would need to cancel our meeting with Gerry Koren, the Israeli ambassador in Czech. Yesterday morning Mr Koren informed me that we are invited to meet him at the ambassador’s house in Prague. We were very excited from the offer and even though the strike ended last night, Mr Koren kept the meeting at his house. So we left in the morning to take the subway out of the touristic area for our meeting. The ambassadors’ house is very impressive and is decorated with many very ancient Jewish artifacts. After trying some homemade apple strudel that the ambassador insisted we try, we sat down with him and his Parliamentary assistant to hear a bit about the relationship between Czech and Israel. According to Mr. Koren, getting to be the Israeli ambassador in Czech is sort of like winning the foreign ministry lottery. That is because Israel has a relatively long and solid relationship with Czech, so unlike many other European countries, the ambassador in Prague is well accepted within the political field and isn’t required to constantly deal with obstacles that are put in his way. 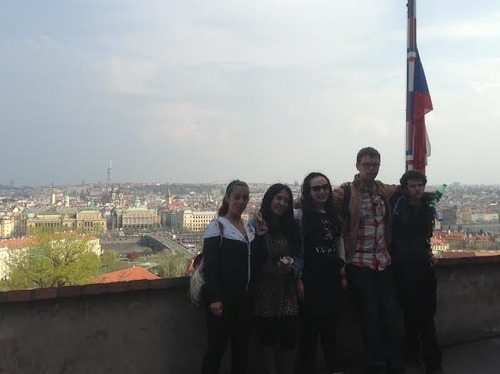 Over all Israel is well represented in Czech and the Embassy is working on keeping it that way through the media and in the many different high schools, where lessons about Israel are given by the embassy. 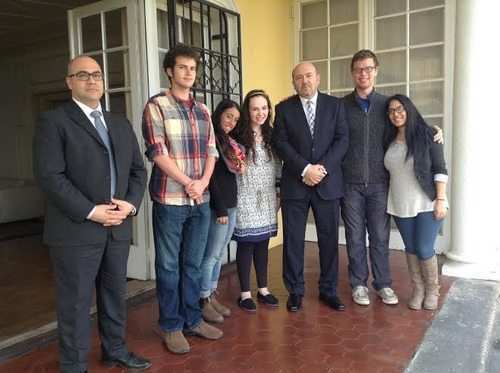 Each group member introduced himself in his turn and asked the ambassador a question or two. Natasha asked what is the most rewarding aspect of his job. He said that he loves his country, so helping people see other sides of Israel and changing the way they think, is his reward. Karin noticed how the Czech are such a quiet people… she noticed it on the subway when the quiet, according to Karin, was a little disturbing! You can see that she spent a lot of time in Israel where the public bus is considered to be the best place to speak on the phone and listen to music. Yes. It is very different here! 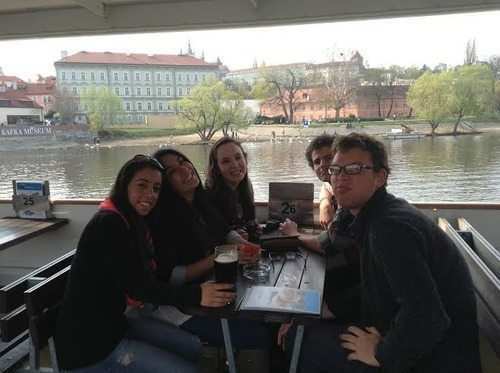 We went back to the center to have a nice Czech lunch to enjoy the local cuisine, after we were done with our “Goulash” we went for a nice relaxing one hour boat ride in the Valtava river. 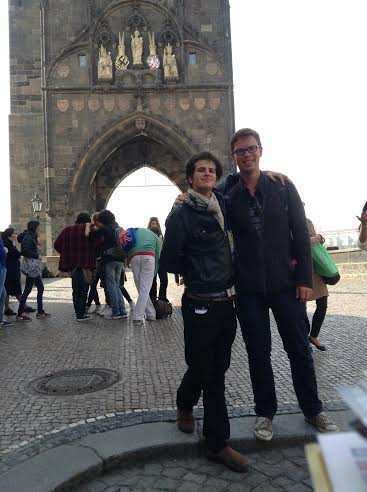 We passed under Charles bridge and by some of Prague’s well known sites. Even though we had an Audio guide, we didn’t get much information out of this cruise because the heavy Czech accent the Audio voice had, was simply impossible to understand. but it didn’t really bother us… We had a relaxing time just admiring the view, the sun and the sound of the water. 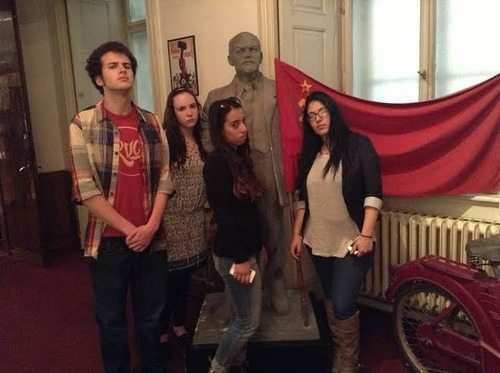 Later on we went to the Communist Museum, this place describes the Communist takeover of Czech and specifically Prague. Can you imagine one day waking up to a reality where you no longer decide how many eggs you can bring back home from the grocery store, as it is now a governmental decision? You can tell that these days are long long gone by the simple fact that the Museum of Communism, a movement that believed in the equal distribution of wealth, is located in the same building and the same level with a local casino. 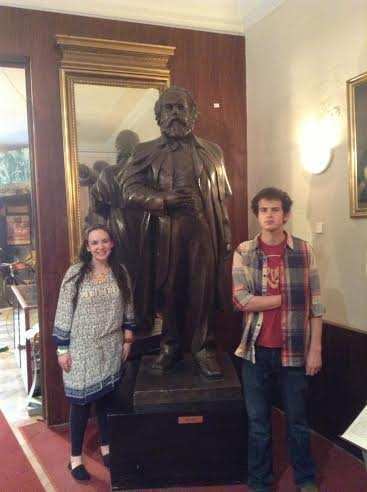 How ironic… In the attached photos you can see the group standing next to a statue of Lenin and of Karl Marx. 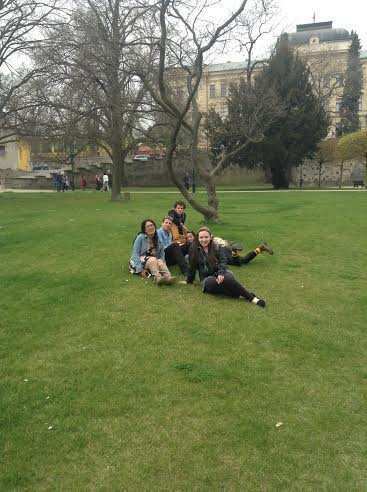 We later went to the Prague Castle (the biggest medieval castle in the world) after a few minutes of climbing up towards the castle we collapsed on the stairs in order to catch our breath and prepare ourselves for the steep climb up. When we finally got to the top, the view was worth it! You can see for yourselves in the picture attached. We went into the castle and into the St Vito Cathedral which is the largest Cathedral in Czech. We felt like we were in an episode of Game of Thrones or Lord of the rings, luckily, the monotonic voice of our Czech tour guide pulled us back to reality. We continued to the Golden alley where the King had once placed Alchemists to try and produce gold for him, when they couldn’t deliver, he got rid of them and brought in merchants to live there instead. We went into a knights armor exposition where Ian, Ben and Rachel practiced shooting an Automatic cross bow (I believe that is what it is called) Ian was really good, we suspect he might have been a knight in another life… Before leaving the Castle we stopped at the torture tower, where Rachel demonstrated for us how the machinery would work in medieval times. Later that night we went to celebrate Shabbat at Beit Chabbad. We really enjoyed it! After tfilot and Kiddush we sat down to eat, the atmosphere was great and the food as well. We were told that they had just opened this new Chabbad house, the Chabbadniks seemed pretty happy with their new place, as they didn’t stop singing and dancing for a minute, not even to eat. We sat at a table with two very nice Jewish girls, one of them is from Hong Kong and is planning to go to Israel next week in Pesach. There is a good chance she’ll meet some student from our small group in Israel. Here is a little of what we did on our fourth day of the trip. 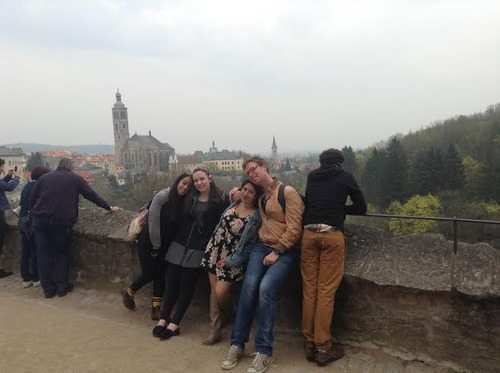 We left first thing in the morning for a tour to Kutna Hora, a small silver miners town outside of Prague. We started our tour in the church also known as “The Bones Chapel”. 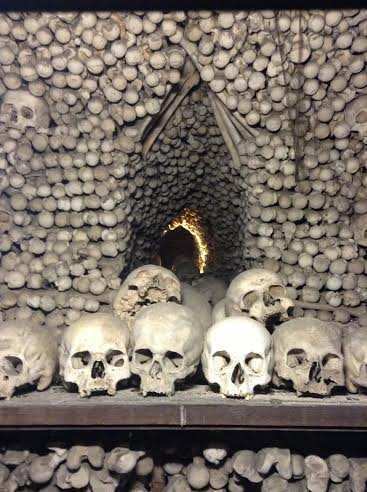 The church is decorated with bones of over 40,000 people! The answer to why would anyone do such a bizarre and horrifying thing lies, like with many other religious acts, in Jerusalem. It all started when a monk from that area arrived to Jerusalem and brought back a pile of dirt from the holy city. He scattered the dirt on the ground next to his residence. When people heard of it, they naturally decided that that is where they want to be buried, the only problem was that the demand was larger than the supply. When the town began to bury the fallen fighters and plague victims there, there was very little space left. As I said before, it was holy ground, which also makes it a perfect location for a church, the only problem was, in order to build one, the graves had to be dug out… You can see where this is all going. 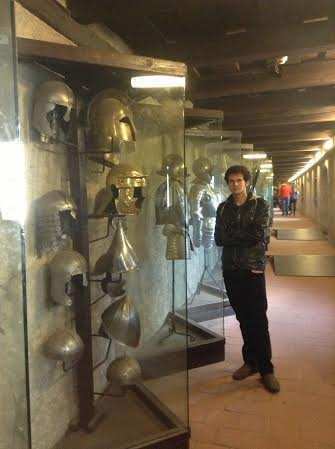 The interesting thing is that most of the interior “decorations” were put together by a half blind monk. The bones are there for “a constant reminder of death”. So yep, it is pretty creepy… You can see why the girls needed only 6 minutes to get the place’s vibe and wait outside for the next part of the tour. From there we went to St. Barbra Cathedral which is quite an impressive structure. The architecture is very impressive and it is located on a hill with beautiful view! We took our time to stroll around the Cathedral to simply admire the view. We sat down on the grass to wait for the rest of our tour group to show up, and then followed our tour guide inside. 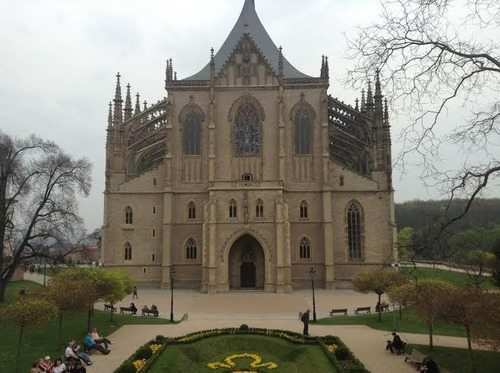 The Cathedral was planned by the same guy that planned Charles bridge and St. Vitus Cathedral and the construction took about 500 years to be completed! 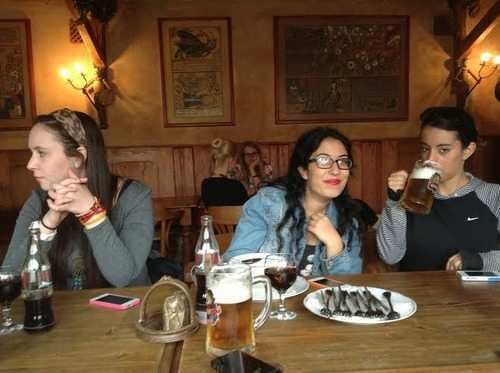 From there we left for lunch at a local restaurant, we really didn’t want to stand out in the crowd so we had to order some beer to take down the food with. It was Ben’s 20th birthday and it didn’t go unnoticed! He was sung happy birthday to by: 2 Taiwanese girls, an Australian couple, 3 British folks, 1 Czech, us of course, and a few more people we are not exactly sure where they were from… It doesn’t get more international than this! After seeing all the different things that silver can buy, we headed back to Prague and went for dinner at an Indian restaurant. Two of Karin’s friends (or in the term she used- two real life Czechs) had joined us for dinner. 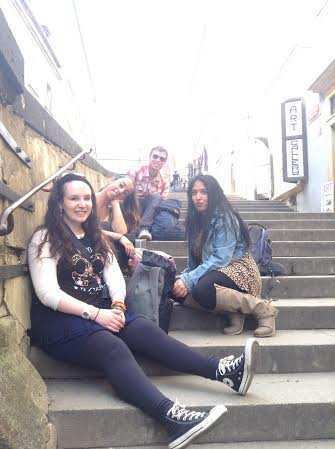 This was Karin’s chance to impress them with all her new found knowledge of Czech. She pulled out names, dates and everything! It was indeed very impressive but not surprising at all! As this group is not only a fun group of people to spend time with, but also seems to make an effort to really get all they can out of everything we do! I’ll let you know how it was for the group after we are back in Israel. 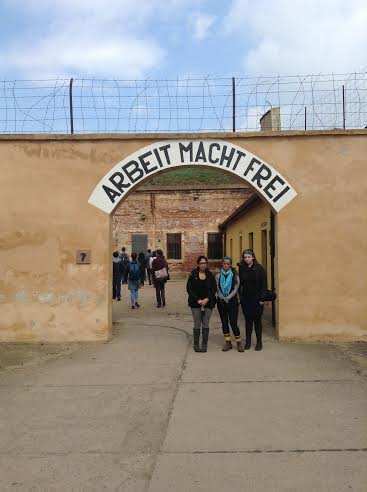 On our last day in Prague we set off to Terezin also known as Terezinshtadt, a town outside of Prague where the Nazis built one of their largest concentration camps. 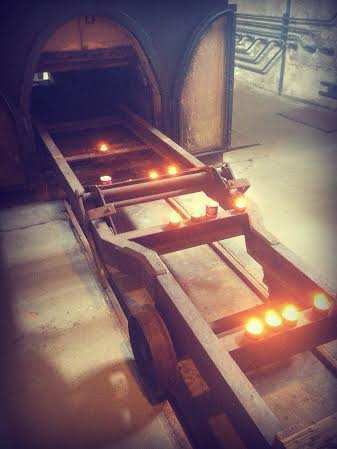 The concentration camp was built in an old fort from the days of the Austro-Hungarian empire. 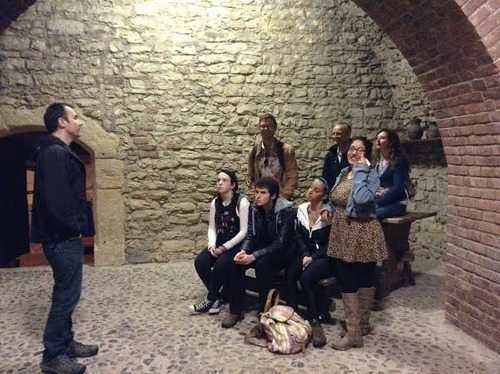 We started our tour in the Small fortress, our tour guide was an old and very vibrant Czech guy that walked us through the many rooms and courtyards of this historical site. Teresinshtadt was also meant to create a false image for outer visitors. The Jews there, even though they lived in a very high density and inhuman conditions, were allowed relative autonomy to create culture in the camp. Our guide took us through the crowded rooms and dark isolation cells, the rooms had up to 700 people living there at the same time and when they ran out of room, the isolation cells used as regular rooms as well. It is quite a horrifying place. 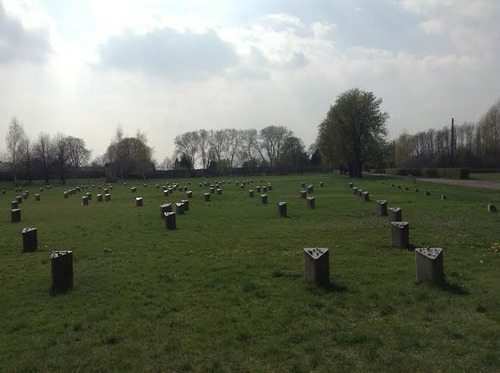 160,000 Jews were sent to Terezin, only 19,000 survived, the rest either died from a plague, hunger or were sent to the extermination camps (mainly Auschwitz). We sat down to see a short Nazi propaganda film that was meant to create a false image of the Ghetto, we also went by the Nazi officer’s residence, that had a big swimming pool that was built by the Jews for the Commandant’s daughters. 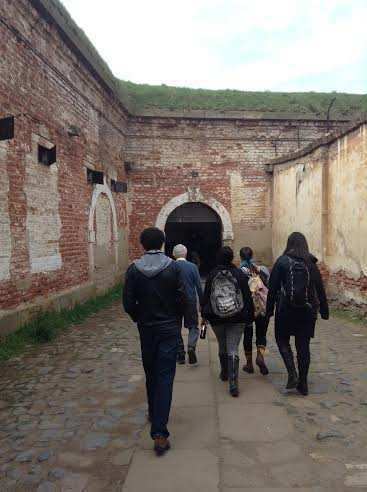 I’m happy we got to see this place, as not many groups get to visit Terezin since it is not in Poland and hence not included in the March of the Living tour. From there we strolled to the other side of this very grey town, to the Jewish cemetery and crematorium. the crematorium used to have urns stacked up in front of the entrance to make it seem like the Nazis are giving a proper burial to the dead. Obviously, that wasn’t the case… We paid our respects and lighted a “Ner Neshama”, memorial candle, that we had brought with us from Israel, and then walked back to the graveyard to read Kadish for the dead. It was not an easy day but a very important one to understand the magnitude of the Holocaust and the endless human cruelty. We got back to Prague after an hour bus ride to prepare for our departure back to Israel. We spent our last few hours in Prague at the old town center, doing all the last few things we didn’t get the chance to do in the past five days. We ate our dinner in a very verrrry Czech restaurant to properly say goodbye to the Czech cuisine and left to the airport. And that is it… We are back in Israel and back to routine! 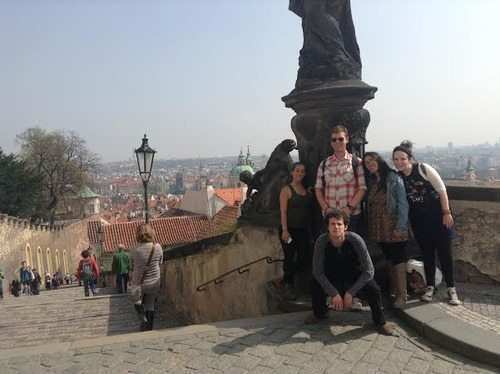 I think the group really enjoyed Prague, it is a beautiful city with rich history and a lot to see. 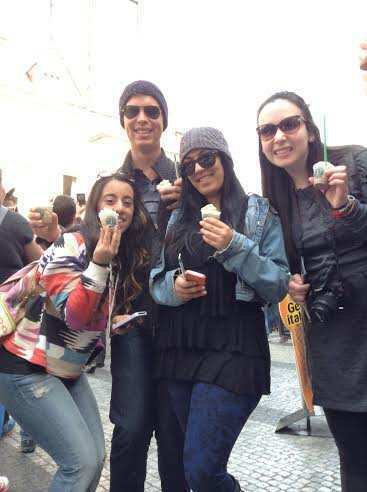 I know I had a great time with the group!